Computing environments may revolve around heavy usage of NFS infrastructure. Network areas are hosted and provided by storage file servers, with compute servers mounting the exported areas into their directory tree. Periodically, the mounts expire when not in use and are removed from the directory tree on local machines. If NFS traffic between file servers and compute servers is disrupted, machines holding active mounts will not be able to release them. This could happen in several cases. A potential root cause for the problem might be a network outage; however, this issue will be resolved the moment network traffic is resumed. A far more serious scenario is when a file server stops its service due to malfunction or coordinated maintenance, including an EOL (End of Life) cycle. Any host holding active mounts of areas exported by a file server that is no longer reachable will not release them. This situation leads to so-called stuck mounts. Any process running on an affected computer server waiting for NFS activity will remain in uninterruptible sleep state without any way to kill it. Up to date, the only sensible solution was to reboot affected hosts. However, critical computer servers, including infrastructure and interactive-use machines, cannot be rebooted without prior coordination. This leaves a time window until the next reboot, during which the affected hosts will continue running in an unstable state. A dedicated host used for faking the IP addresses—we use a virtual machine with minimal hardware requirements. The virtual machine is assigned a separate NIC in the virtualization server. This host is known as the Admin server. A network infrastructure that supports on-the-fly assignment of the "fake" file server (Admin) to the file server VLANs. 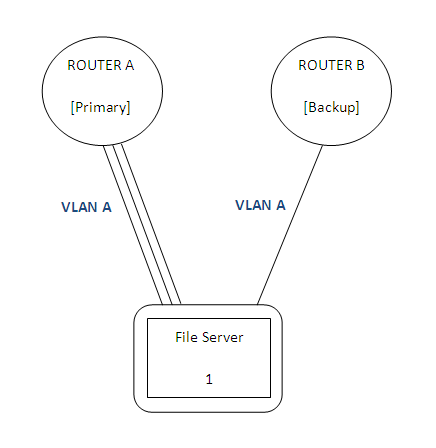 Admin is connected directly to the NFS router using a single standard NFS connection, with a 3Gb channel to primary port and 1Gb channel to backup port (Figure 1). A Web interface for assigning Admin to file server VLANs. A mechanism to change the IP address on Admin, which can be automated (scripted) or manual. In our site, Admin is a virtual machine hosted on a virtualization server. The host runs a standard enterprise Linux image; however, it is used only for IP changes and no other purposes, and is configured with minimal disk space and memory. The virtual machine is assigned its own NIC in the virtual server network configuration. 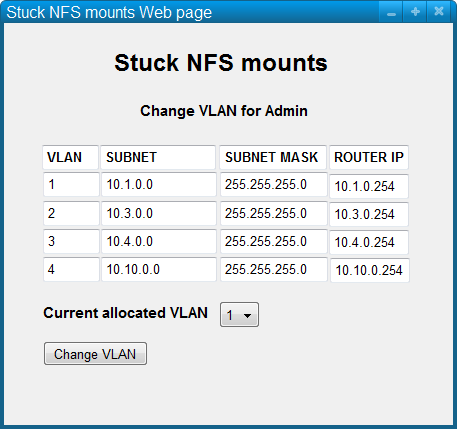 The NFS stuck mounts VLAN change is executed using a Web interface. The GUI allows system administrators with no networking knowledge or access permissions to change the VLAN allocation for the specific router port where the dedicated server is connected to the desired VLAN. The GUI has a static configuration file, with the server name, router name and dedicated port. Once called through the Web interface, it uses SNMP to collect the data from the router and present the table in the middle, the current status and the VLAN drop-down menu. Figure 2 shows a mockup of the Web interface. On clicking the Change VLAN button, the script, using SNMP, changes the VLAN allocation for the specific port. Figure 3 shows the network flow. Stuck mounts usually are identified by indirect symptoms exhibited by affected hosts, such as increased load due to a large number of processes in an uninterruptible sleep state or lsof not being able to complete its run. The first step is to open the Web interface and change the VLAN to that matching the unreachable file server. Once that's done, data-center operations technicians are instructed to change the IP address and default gateway on the Admin server to match that of the unreachable file server. Alternatively, the IP address and default gateway can be configured manually by logging in to the machine via the virtualization console and performing the change. The host IP address can be changed under /etc/sysconfig/network/ifcfg-ethx or ifcfg-eth-idxxx; the default gateway is configured under /etc/sysconfig/network/routes. Once those two steps are complete, the network service on Admin needs to be restarted with /etc/init.d/network restart. The "fake" file server will come up and start rejecting NFS requests from affected hosts, releasing the stuck processes. At this stage, system administrators also can try to umount the stuck mounts. We encountered a number of challenges in setting up this solution. On the network side, file servers are connected to routers; whereas compute servers are connected to switches. This necessitated an innovative approach by the network operations team, which resulted in the dedicated connection to the NFS router. Furthermore, this solution requires allocating site assets to be used only rarely. We chose the virtual machine because of reduced cost and higher flexibility in the setup rather than using a physical machine. Finally, the IP/VLAN change procedure requires discipline and some skill on behalf of system administrators to use it effectively. We first tried the stuck NFS solution as a hack by manually changing the IP address of a standard computer server located on the same segment as the unreachable file server more than a year ago. The attempt proved successful, and we were able to save a number of important infrastructure machines with stuck mounts, preventing downtime and reboots. Prompted by this early success, we implemented the full solution and have used it on a number of occasions. In July 2010, we prevented a number of Samba servers from being rebooted, alongside another 21 compute servers. The stuck NFS mounts solution has a direct impact on our ability to recover from unexpected file server outages. We also are able to mitigate scheduled file server EOL leftovers without reboots. In fact, one might argue that the solution creates leniency that may lead to lesser discipline in using strict file server EOL procedures, which requires all mounts to be removed before the file servers are shut down. We believe that the stuck NFS mounts solution does not replace hard work and adherence to procedures and should be used only in an emergency. The stuck NFS mounts solution is a valuable asset and a necessity in large and dynamic environments. It allows us to maintain high uptime of important machines, without unnecessary reboots due to mistakes or file server traffic disruptions. Our solution is simple and effective, and it has proven its worth on several occasions in real-life circumstances. The implementation is transparent to users and allows system administrators with no network operations of NFS permissions or extensive knowledge to recover systems quickly and easily. We recommend its use as a standard in computing environments that rely on NFS infrastructure.